Born from a desire to do something, a need to say something, a desire to be a part of something bigger, something that makes a difference, that might stop one more woman from feeling she wasn’t good enough or just that little too much (too emotional, too aggressive, too bossy, too loud, too opinionated, too fat, too skinny, too everything). Courage through connection, change through conversation. 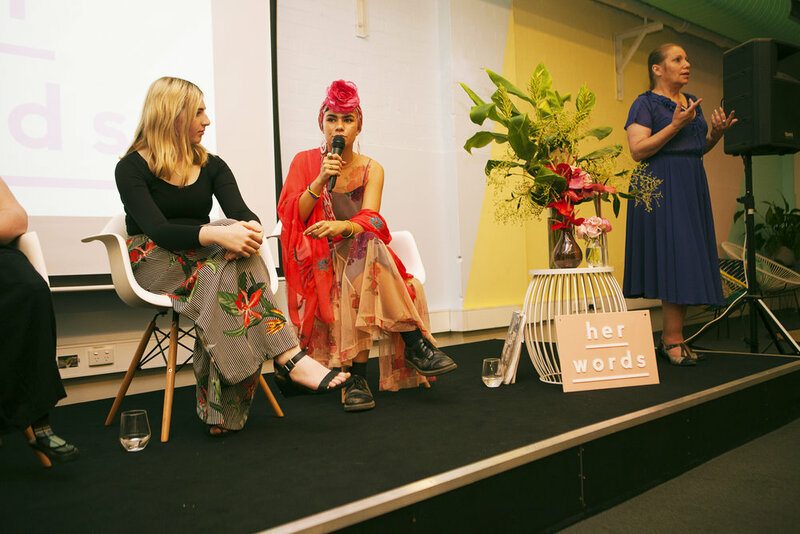 her words is a space for women to share their stories. Our mission is to inspire courage through connection and change through conversation. Our goal is to give a platform to diverse women and diverse stories, to help enable all women to feel valued, reflected and represented on screen. We know the power of seeing that reflection. We feel it too. We’re on a mission to ensure every woman knows her words matter. Will you join us? The media plays an important role in shaping societal values, beliefs and attitudes and representation in Australian media is a huge problem. Not only when it comes to representing women, but representing diverse women. When half the population are not seeing themselves reflected or are limited by harmful stereotypes, this severely restricts our ability as a country to challenge privilege and prejudice and create change. Society changes first with individuals, and her words sets out to be a part of that change. her words is brought to life by a team of talented women and non-binary people. We also offer mentorship opportunities to women wanting to learn more about filmmaking and content creation so that more women are able to tell their own stories. If you're interested or want to find out more, get in touch below. We don't believe in just adding a logo to a marketing document - we believe in true collaboration. That's why we only work with partners who align with our values and are truly committed to contributing to women and gender equality in Australia. From events, to film production, to product, there are lots of opportunities for your business or organisation to get involved. "Thank you team her words for drawing me out of my comfort zone; helping me to explore the inner strength and resilience I failed to see in myself."